On my mind as of late has been the realization that we are all merely hairless apes that found a way off of the African savannas. Listen to the crowd roaring in an appreciative cacophony, “SCIENCE!” they cry, and, “EVOLUTION!” Huzzah, I add. As a subtle result of this, I have been inadvertently thinking, among other things, “Mere humans, you are nothing more than arrogant apes, following hairless ape patterns, principles, perversions and instincts, and yet you do think so highly of yourself. You even think that a human-like PERSON created the entire universe, and that you are the center of it. That is very ape like, very DUMB and self centerd. Grow up, see past your nose.” Not about a rejecting God here, just that particular idea. I personally think that God, or the Ultimate Transcendental Cosmic Intelligent Beingness is beyond human form, beyond binary sexual identification, beyond all that jazz. I also happen to find deep inspiration in the concept that so are we, deep in the core of our being, beyond the human form that is constantly changing, constantly withering away, constantly in need of maintenance. It’s all relative, right? We just get to make awesome stuff with all of this stuff while we’re here… and we’re apparently here, so… So anyway, I had it wrong. It isn’t just so that the mere human is in need of being humbled, and reminded of the inner ape within all of us in the light of our huge hubris, not just so. Actually, it’s quite just so that we should consider considering the ape with a much higher regard. 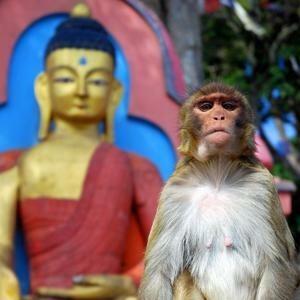 I wonder, at these times, how much of what I do, or what an individual does, is just habit, pattern, monkey, and how much of it is mindfully present choice or response. Presence or habituation, habitual reactivity or mindfull responsiveness. Automation or embodied living.